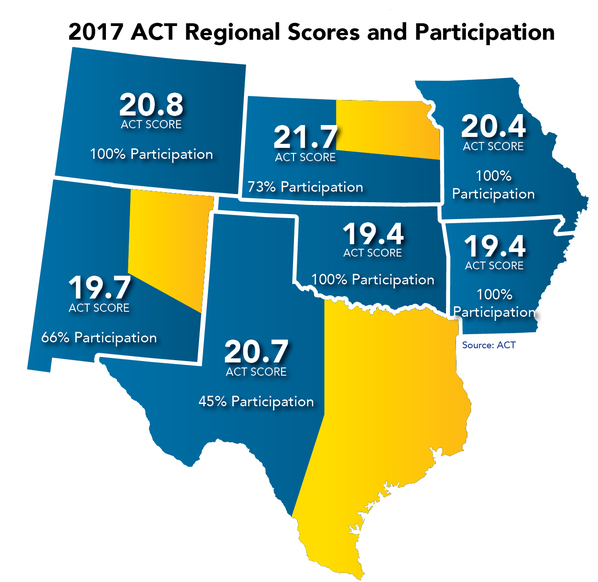 OKLAHOMA CITY (Sept. 7, 2017) – Oklahoma increased its ACT participation by 29 percent in one year – the largest gain of ACT-tested graduates in the country. Oklahoma joins the collection of states identified by ACT as having 100 percent of 2017 graduating seniors taking the national college entrance exam. 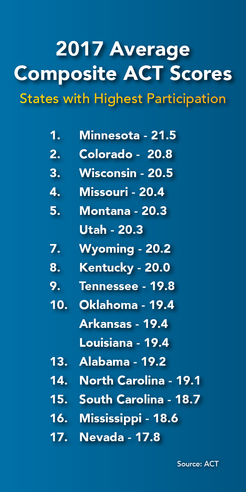 Of those states, Oklahoma tied for 10th place for the top average composite score. Accompanying the dramatic influx of test-takers, Oklahoma’s average ACT score dropped only one point, from 20.4 to 19.4. In 2017, participation grew to 42,405 students from 32,854 in 2016. This change reflects efforts of a statewide 2016 pilot program in which the Oklahoma State Department of Education (OSDE) gave all high school juniors an opportunity to take the exam free of charge. The graduating class of 2017 was the first to participate in the voluntary program. “By opening up the college entrance exam to all students, including those who otherwise might not have had access to the ACT, we are not only providing them an on-ramp to postsecondary education, we are gaining valuable insight into the skills gap we must overcome for our young people to be competitive nationally,” State Superintendent of Public Instruction Joy Hofmeister said. Achieving a benchmark score in an ACT subject area indicates a student has a 50 percent chance of obtaining a B or higher or a 75 percent chance of earning a C or higher in a corresponding course in college. The four ACT benchmark areas are English, reading, mathematics, and science. Subject-area benchmark scores range from 18 to 23. The 2017 data reveals that 42 percent of Oklahoma graduates did not meet any of the ACT College Readiness Benchmarks, while 16 percent met all four. “This is the first time we have had a complete picture that can predict graduates’ readiness to compete in the global marketplace. Before now, our state ACT scores did not measure the needs of the ‘hidden’ student – be it a low-income student who could not afford a college entrance exam or a rural student who could not reach a testing site. Now we can pinpoint which students need help to bolster their skills before graduation,” Hofmeister said. Hofmeister said the more comprehensive Oklahoma Academic Standards in mathematics and English language arts, which were implemented last school year, will help boost student achievement. More complex assessments measuring those new standards were first given to students last spring, and results are expected later this fall. The state’s new standards and assessments are part of OSDE’s strengthened efforts to ensure students are nationally competitive and able to achieve academic excellence, one of four overarching pillars in the state’s eight-year strategic plan. The strategic plan is a central element of the consolidated state plan OSDE will submit next week to the U.S. Department of Education, as required by the Every Student Succeeds Act, or ESSA. In addition, one of the goals of the state plan is to reduce the need for college remediation in math and English language arts by 50 percent. Currently, 38 percent of all first-year college students in Oklahoma require remedial courses before earning college credit, costing Oklahoma families an estimated $22.2 million each year. “We must prepare students for the next step once they graduate from high school. We are confident those efforts will be reflected in higher numbers of college and Career Tech enrollments and in reduced college remediation numbers,” Hofmeister said. Oklahoma’s average composite ACT score of 19.4 was identical to Arkansas, which also had 100 percent participation. Colorado and Missouri were higher-scoring regional states with 100 percent participation. Nationwide, the average composite ACT score increased slightly, from 20.8 to 21, while the number of test-takers dropped by about 60,000 students. In Oklahoma, nearly half (47 percent) of the test-takers expressed an interest in science, technology, engineering and math careers.